KUALA LUMPUR: Bandar Raya Developments Bhd (BRDB) may have a tough time convincing minority shareholders to approve a major asset sale as the offer was below book value and it is not using the bulk of the proceeds to replenish land. On Monday, BRDB agreed to accept a RM914 million offer from major shareholder Ambang Sehati Sdn Bhd to buy four properties from the group. The assets have a book value of RM942 million. "For BRDB to monetise their assets, it is fine to sell if the price is right or at attractive levels. But we think it might be tough for BRDB to get its minority shareholders to approve the deal," an analyst with OSK Investment Bank told Business Times. Ambang Sehati is buying CapSquare Retail Centre, Permas Jusco Mall and all of BR Property Holdings Sdn Bhd, which owns Bangsar Shopping Centre (BSC) and Menara BRDB. Ambang Sehati, which owns 18.8 per cent of BRDB, is controlled by Datuk Mohamed Moiz Jabir Mohamed Ali Moiz, who is chairman of the property firm. It proposes to pay a preliminary cash payment of RM430 million and assume RM484 million in liabilities related to BSC and Menara BRDB. Following the proposed disposal, BRDB plans to distribute RM390 million from the assets sale to shareholders via a net cash dividend of 80 sen apiece, and use RM302 million to pare down debt. AmResearch thinks the money could have been put to better use. "While the proposed dividends are attractive for minority shareholders, we believe the cash proceeds are better off deployed for landbanking purposes or to fund its future developments, especially when its property development unit has been lacklustre due to delay in launches," it said in a report. OSK has downgraded BRDB from "buy" to "trading buy" and increased the target price from RM3.06 to RM3.14 effective yesterday, taking into account the special dividend. AmResearch, meanwhile, is reaffirming its "hold" rating on BRDB with fair value unchanged at RM2.45 a share. 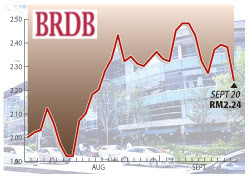 Shares of BRDB fell 14 sen to close at RM2.24 yesterday.